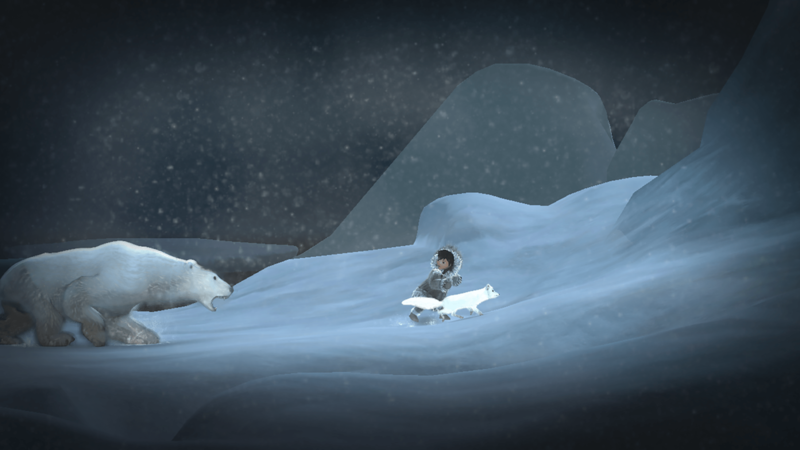 Never Alone is an atmospheric puzzle-platformer game that seeks to educate players on the folklore and culture of the Iñupiat people. Originally released for console and PC in 2014 and 2015, it became available for mobile this summer with the Ki Edition. The game is quite enjoyable, and if you choose to delve into the extra content, you’ll appreciate it even more. I played this on an iPhone 6S. 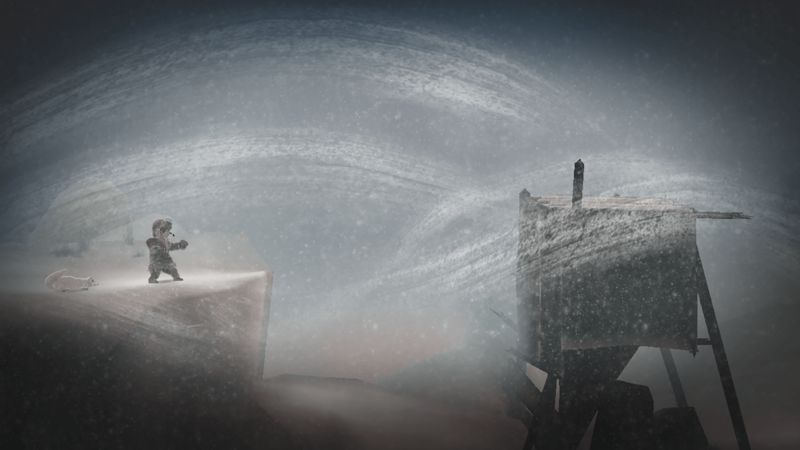 In Never Alone, you play as Nuna, a young Iñupiat girl whose village is set upon by a terrible blizzard, preventing anyone from hunting or even going outdoors. Nuna, however, decides to set out to find the source of the blizzard. She’s joined on her journey by a fox who can sense and interact with the many spirits scattered across the land. Occasionally, battles arise that the pair will have to deal with. You swap between characters, using their unique abilities to push forward. Nuna’s abilities allow her to push and pull heavy objects and using her bolas to break things; the fox is smaller and more agile, and his abilities allow you to commune with the spirits in creating and moving platforms. The game has many checkpoints, though they’re not always available, so be sure to save when you can. This is a game that likes to drop obstacles and traps on you out of nowhere, with little to no chance of avoiding those obstacles or traps the first time. It’s best to keep moving, as platforms will often break right out from underneath you—however, there are plenty of occasions where you can stop and let the fox take over. Near the game’s end, you’ll be switching between the characters often, under a time limit. Unfortunately, this is where the touch controls start to fall apart somewhat. In these late-game puzzles, you might run into a few frustrations during tense moments. Turning at a moment’s notice on the virtual stick proves problematic. And with multiple virtual buttons on screen, puzzles for which you need to do an action with a character, swap to the other, and then perform an action with the new character often end in heartbreak. It can be completely frustrating in a few spots. Never Alone is only a few hours long, but I feel like that’s about the right length for it. The game plays best when it’s running you through the paces of its tried-and-true mechanics. The attempts at more creative solutions don’t translate to mobile quite as well because it’s difficult to figure out what the game is trying to get the player to do. However, despite the occasional frustration, the graphics are utterly stunning throughout the game. Never Alone will test the limits of your device, generating beautiful snowstorms, fascinating lighting, realistic water, and platforms and landscapes that fall apart in a believable manner. The sound effects pull you into the wintry environment; the crunching snow underneath Nuna’s feet and the sound of the howling wind is mesmerizing. The game has a narrator, as well, who occasionally cuts in to further the story. His lines are 100 percent spoken in the Iñupiat language, with subtitles in the language of your choice. The amazing presentation comes at a cost, however. It should go without saying, but the game is a serious drain on the battery. I constantly had to keep an eye on my battery charge or just plug in to play. More than a few times, I nearly lost my progress because my battery was nearly dead and I was not immediately near a charger. I would recommend keeping close watch on your battery life or to playing plugged in. My only other complaint with this game is that you can only hear the audio when you use headphones. All told, at $4.99 for the app, Never Alone: Ki Edition is a great game. I recommend it highly.